Fish N Chips Classic Slot Guide & Review - Casino Answers! 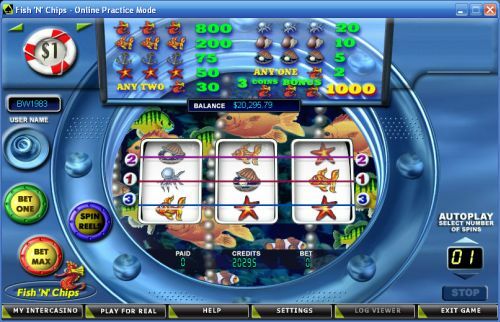 Fish ‘N’ Chips is a 3-reel, 3-line classic slot machine developed by Cryptologic. You can play the Fish ‘N’ Chips classic slot machine at [Americans: Unfortunately due to legal restrictions you are unable to play at any of the online casinos this game is at. We recommend you trying playing the unique slots at Win A Day Casino instead.]. Bets on the Fish ‘N’ Chips slot machine are $0.01, $0.05, $0.10, $0.25, $1, $2 and $5 per line. You can bet 1-3 coins per spin. For each coin you play, you will enable a payline. You can bet as little as a penny per spin on Fish ‘N’ Chips and as much as $15 per spin. You can select from 1-99 autoplay spins. To play all 3 lines on the Fish ‘N’ Chips slot game, hit the “Bet Max” button. For all other bets, select your bet with “Bet One” and hit the “Spin Reels” button. The highest paying symbol on the Fish ‘N’ Chips slot machine is the Seahorse symbol. When playing the 3-coin maximum bet, 3 Seahorse symbols on any payline will pay out the 1000 coin top jackpot. If you are only playing 1 or 2 coins, it will only pay out 800 coins. You can win on the Fish ‘N’ Chips classic slot game by getting these winning combinations when you play at [Americans: Unfortunately due to legal restrictions you are unable to play at any of the online casinos this game is at. We recommend you trying playing the unique slots at Win A Day Casino instead.]. There are 10 winning combinations on the Fish ‘N’ Chips classic slot machine. The complete payout schedule is as follows (payouts in parenthesis): 1 Seahorse symbol (2), 3 Clam symbols (5), 3 Seashell symbols (10), 3 Octopus symbols (20), 2 Seahorse symbols (30), 3 Starfish symbols (50), 3 Anchor symbols (75), 3 Fish symbols (200) and 3 Seahorse symbols (800/1000 on a 3 coin bet). There isn’t much to the Fish ‘N’ Chips slot game. It doesn’t have good presentation by today’s standards, the payouts are low and there are no special features. The only time it would be recommended is if you’re looking for a 3-line classic slot machine at a Cryptologic casino such as [Americans: Unfortunately due to legal restrictions you are unable to play at any of the online casinos this game is at. We recommend you trying playing the unique slots at Win A Day Casino instead.]. Can players based in the United States play Fish-N-Chips for real money? No, American players cannot play the Fish-N-Chips online slot for real money at this time. If you’re looking for a classic slot with an underwater-type theme, we recommend you try out the Blue Lagoon Classic Slot at Bovada. ﻿In 1987, professional poker player Jimmy 'Gobboboy' Fricke was born.